January has been such a cold month. You might find yourself wrapping your hands around a warm cup of tea or coffee to keep warm, or thrusting them into your pockets while outdoors. 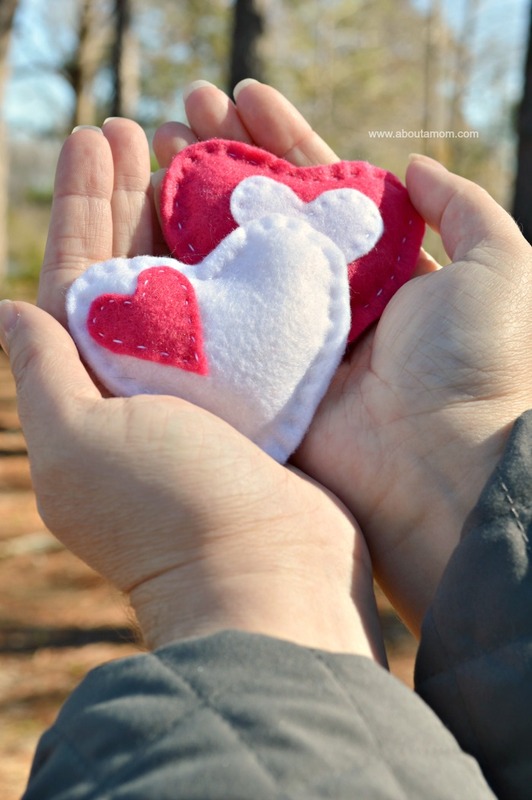 With Valentine’s Day just a few weeks away, I thought it would be fun to make some DIY Heart Hand Warmers to give as gifts. These soft fabric hand warmers are perfect for chilly days, and are sure to be appreciated by the lucky friends who receive these as gifts. 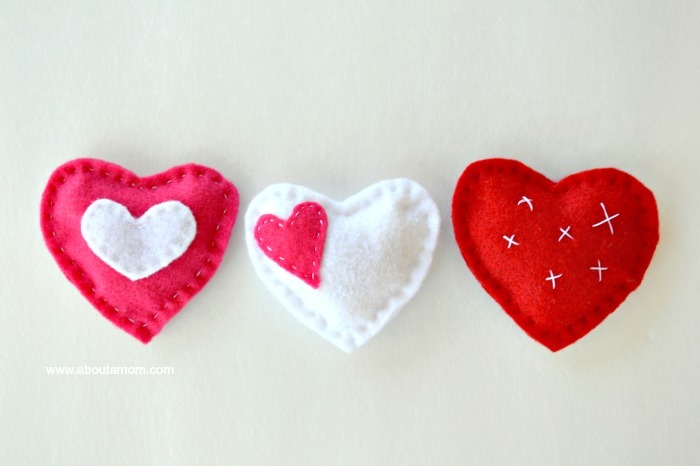 This Valentine craft project is great for using up bits of scrap fabric or felt. You could even upcycle an old pair of flannel pajamas. I think a well insulated fabric such as felt works great for this. Plus, this is what I happened to have on hand. You can make a lot of these with just a small amount of fabric. For a variety of colors and prints, you could pick up a bunch of different fat quarters for quilting. I filled my heart hand warmers with rice, but you could alternately use dried beans. To use the hand warmer, you simply pop it into the microwave for about 30 seconds to warm the rice or beans, and place it into your pocket until you are ready to use it. 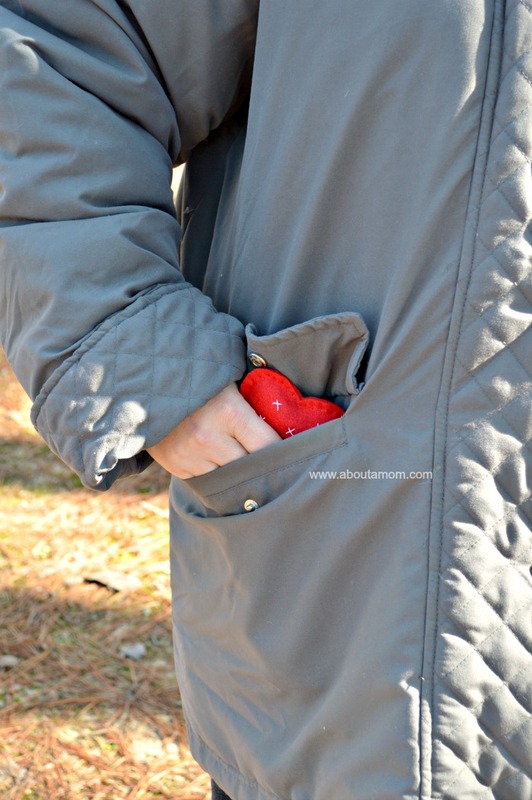 You will be amazed by how well these hand warmers work. They are perfect for when you are taking the dogs for a walk or spending an afternoon at the park with the kids. You can make these in one solid color, or embellish them a bit using thread or additional scraps of fabric. For some of them, I cut smaller hearts in contrasting colors and hand stitched them onto the top. 1. Make your heart shaped pattern. There are a couple of different methods you can use. The first option is to fold a sheet of paper in half, cut out a half heart around the seam, and open to reveal a complete heart. Optionally, you can trace around a heart shaped cookie cutter. The latter is the method that I used. You will need to pieces of fabric per warmer, in equal shapes/sizes. Keep it at a size that will fit well into the palm of the hand. 2. With a hand stitch, sew around the perimeter of your heart, keeping the stitch small so that your rice doesn’t fall out. You can optionally use a sewing machine to do this, but hand sewing takes no time at all. Leave about a 1 inch opening, to fill the heart with rice. 3. Use a funnel to fill the heart with rice, and then stitch the opening closed. If you don’t have a funnel, simply make a cone from a sheet of paper. To use, warm up in the microwave for 20-30 seconds, but make sure they aren’t too hot before handing over to little hands! If giving these as gifts, be sure to include a note with warming instructions. I love a simple project like this. My mom, Laura, and I made up a bunch of these while watching television the other night. I hope you enjoyed this project! I love this idea! It’s been so cold here that I know it’s a gift that would really be used! These are so cute! What a great gift to give to someone in a cold month like February. My hands are ALWAYS cold, so I need to make me some of these. Great idea. What a cute and practical gift for those of us that live in a cold climate! I think I will make some of these for my grandkids for our sledding trip. I would love to make these! I remember living where I was in constant “want” of hand warmers and this would be a great gift to those who still live in those cold areas. Thanks for sharing. These are so cute!! Can’t wait to make these with my daughter and send them to friends and family for Valentines. Love these!! Those are adorable! What a great idea to make them as little Valentine’s Day gifts! Aww these are adorable! That’s such a good idea for taking the dog on a walk or getting the mail! My sister is Maryland is always cold. I honestly don’t know how she manages the winters. I would love sending her a little warmth & love! These are so cute! I love that they’re little hearts! That is a fantastic idea. So warming. What a super cute idea! I love this. Will be making some of these. Now this is a cute little craft kiddo can do. She is starting to hand sew. What a great gift, especially for those of us up here in Michigan! Oh, I LOVE this! My mom’s hands are always cold (at home) – I’m making this tonight. Thank you!!! These are very festive and perfect for the cool weather we’ve been having. I like that they can easily be stored in pockets once you’ve finished using them — and so they can be reused later. What a fabulous idea!! I love using felt in crafts! This is absolutely adorable! Functional, thoughtful and cute! What a great gift idea. These are so cute! What a perfect little Valentine’s Day gift! That is the cutest idea! That’s just an adorable Valentine’s Day gift. These are so super cute! Great idea and simple enough for me to make! This would be fun to make for the kids to use this winter. What an adorable craft idea. Thank you for sharing with us. I love this craftiness, now we just need colder weather :-). I invite you to share at my Thursday hop. You can still link up until midnight tonight) Hugs! What a great idea!! They are cute AND useful! In the main part of your blog, please change the 30 MINUTES in the microwave to 30 SECONDS. Sure someone will start a fire with that direction. Otherwise love following your blog. I thought the same thing. But it hasn’t been changed. Those turned out so cute! This is a perfect idea as a teacher’s gift! Thank you for linking up at Show Me Saturdays, you were featured on SWEET HAUTE blog. Hope you’ve linked up at this week’s party!! 30 seconds not minutes right ?!? Hi! Yes, just 30 seconds. Thanks for asking! Wow are these adorable – and so easy! I’d love to make some to give away! I love this idea it is so clever and a fun craft for us to try thanks for sharing. 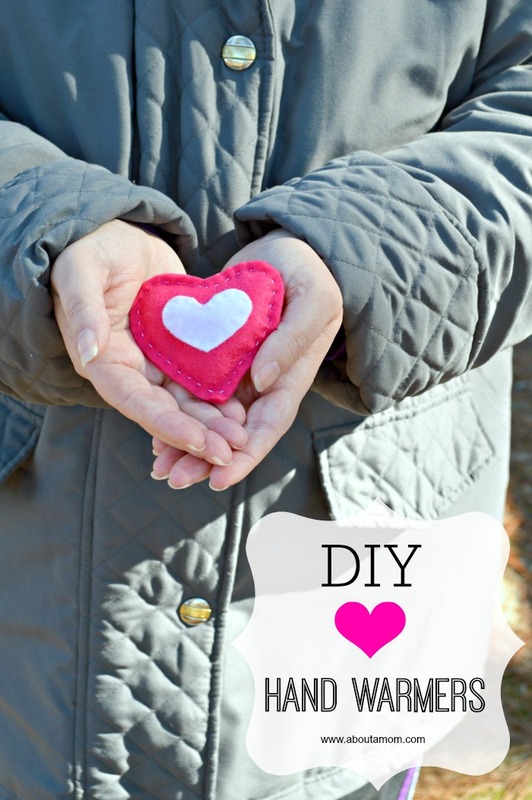 what a great way to make such cute DIY Valentine craft heart hand warmers. it looks simply easy and fun too. these are soo cute!! I am going to have to try and make them!